After a successful maiden MLR season last year, a few players from the USA’s top division moved across the pond to the UK to take the steps in their respective careers. With the new MLR campaign set to begin this weekend, Joe Harvey highlights three players who earned moves to these shores after a successful term in America last year. Lasike’s journey to international rugby was by no means an ordinary one. New Zealand-born Lasike made his name as an American Football player, representing the Arizona Cardinals and the Chicago Bears in the NFL. Originally coming to the USA to play rugby, Lasike joined the Utah Warriors in 2017 after being released from his Chicago Bears contract. Making his Eagles debut in the America’s Rugby Championship, Lasike instantly became a fan favourite with his style of play and played a big part in the USA’s historic victory over Scotland in the summer. Always carrying to the gainline, Lasike is an abrasive player and very much in the mould of a player of yesteryear. 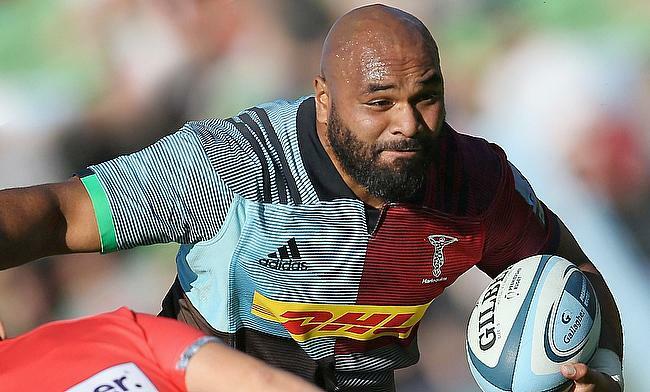 Signing for Harlequins late last summer, Lasike has featured regularly for Paul Gustard and has not struggled when adjusting to English rugby. Like Lasike, Tameilau played for the Utah Warriors in MLR’s inaugural season. Helping the Warriors to the semi-finals of the competition, the forward moved to Glasgow having already had some experience in the British game. Spending a short time at the Newcastle Falcons, the backrow has had his admirers for some time now and obviously caught the eye of Glasgow. Making three appearances so far for Warriors, Tameilau is spending his time in the Scottish Premiership with Currie RFC. At 6ft 5in, the USA international is a very imposing figure on the pitch and probably will be successful at Glasgow over the Six Nations period. It was his performances in MLR that resulted in his move to Scotland and hopefully fans at Scotstoun get to see more of him soon. Bryce Campbell was always heralded as the next big thing in USA rugby. A collegiate superstar, Campbell was the recipient of the 2017 Sholz Award recognition of the centre being the most highly rated college player. Getting to the MLR Championship final with Glendale, Campbell crossed the whitewash regularly for his side, rightfully catching the attention of London Irish. Having already picked up 16 caps for the Eagles, the 24-year-old has a bright future ahead of him. Featuring regularly for London Irish in the Championship, Campbell has adjusted to English rugby with relative ease and will most likely be featuring in the Premiership next season, if Irish gain promotion. Hard-hitting and skilful, Campbell has the potential to be one of the USA’s best exports ever.